What are these sisters sitting upon? The location? Era? How are the two photos related? Do these pictures evoke a memory for you? suggest a story? Share memories of a special family vacation. The Worldometer registers about six million blog posts being published daily. How fortunate I am that you paid me a visit today. Thank you! They are from a family vacation, and you manage to be commenter # 1 again. About the “coming of age” phrase: That’s a tag I ticked because I was thinking about my getting an educated, seeing new sights. But, on second thought, it doesn’t really fit the traditional meaning of the phrase. Thanks for noticing though, Merril! Although I was too young to remember our family trip to Niagara Falls, I do remember seeing photos of the barrel. This reminds me of a tubing trip I took down the Shenandoah River, Marian. Sadly, the water was shallow in spots with lots of rocks! You are on to something, identifying the location correctly, Jill. About your sad tubing experience down the Shenandoah River, so sorry! Yet the setting must have made an indelible impression on your mind as a writer. I like the sylvan scenes you describe in your latest book. I, too, assumed the top photos was taken from a family trip. I’m clueless as to what the barrel is. At first I thought it was an old torpedo…go figure. I do lovely the photo of all the women together. They must’ve been cold even with those coats, but they managed to smile. The same gals are in both photos. Top one is astride one of the old Niagara Falls barrels, and the second one is perhaps those same gals while visiting relatives on vacation. There seems to be a family resemblance. I imagine a wonderful story is behind all this, seeing the awe of the Falls for the first time, the enormity and sound of it! Yes, the girls are my sisters and you’ve identified the location. Because you refer to “the enormity and sound of it,” I wonder if you have visited Niagara, Ginger! At first I thought they were sitting on what looked like a large wooden hotdog bun. But I see the Hill’s Barrel on it. Is the first girl in the first picture the second from the left in the second picture? Or related to her? The girls are related, my younger sisters. In the first photo, I am in the rear, arms folded. And in the second in the back, between my grandma and mother. Thanks for weighing in on the mystery, Marie! My eye was drawn to the 50s era car. A Chevy? The first car I rode around in looked pretty much like that. I like Jill’s barrel memory. And LOVED your link to Worldometer, had not come across that before. Fascinating. The car is definitely from the 1950s, but it didn’t belong to my family. In that time period, my family drove only Studebakers because my dad wanted to support the local car dealer, who sold that brand. We never owned a Chevy. One thing for sure; it was made of steel, not plastic parts. Another blogger alerted me to the worldometer, which I had not seen before. In fact, I didn’t know it existed. I’m glad you found it intriguing. Thanks, Melodie! These pictures must be from the 50s or early 60s. I remember wearing the kerchiefs so our hair wouldn’t get messed up. LOL. A family vacation, perhaps to Niagara Falls. Love these old photos. I must do something with mine. The farm kept dad so busy we didn’t go on family vacations. Vacations were something I read about in books. Although you work hard as a write, now you live in a permanent “vacation” setting in Spain. And you take vacations often, if Facebook and your blog are any indication. I’m sorry your family was tied down to the farm. Your dad must have been a dairy farmer with cows to milk morning and evening. Yes, Niagara Falls was the destination, Darlene. I wouldn’t have remembered that Grandma went along except I have the picture to prove it. Oh yes, as soon as i left home and had a job, I made sure I took vacations! Mom and Dad did take vacations later, but by then I was married and on my own. Dad had dairy cows, beef cattle, pigs, chickens and grain fields. He didn´t believe in putting all his eggs in one basket. There was always work to be done. But it was a good life. It looks like an inflatable dinghy, but not sure if they existed in those days. Is Hill’s Barrow the name of the house the sisters are standing outside of? Intriguing! Hill’s Barrel is the name of the metal barrel that provided adventure for one brave soul, who used it to “ride” down over Niagara Falls. I’m glad you found the photo intriguing. Now you have a clue to the puzzling picture. Thanks, Fatima! I didn’t know that. Thanks for the lesson. I was in the right lines: it looks like a dinghy. Are they in a museum, then? I’m sure this “barrel” and those of other successful adventurers’ are in a museum, or on display in some other venue. It takes a special mindset to undertake such a feat: I’d never dream of it! Oh, great pictures! I’m sure the girls are in both pictures! You have a way of opening my mind to reminiscing about my own family! Thank you, Marian! The girls are my sisters and I in both photos. I wonder my reminiscence these photos triggered in your mind, Anita. I have no idea about the two photos, though the vacation/raft explanation seems plausible. Like Melodie, I found the link to Worldometer fascinating. 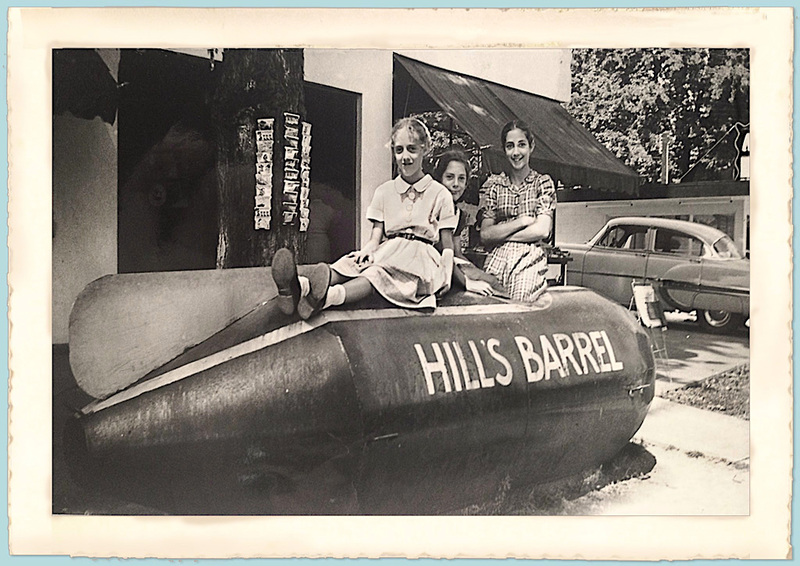 You’re right: The Longenecker family was on vacation but the “vehicle” is not a raft but the barrel Major Lloyd Hill used to navigate Niagara Falls. I’ll probably post a link with more details later today, Shirley. Yes, the Worldometer is fascinating, but I wonder how they glean their stock of statistics, which you probably noticed is constantly flickering with updates. Like Darlene’s family, ours never went on vacation. We were immigrants with no car and a family of ten. However, I do have a memory of my dad, my sister next to me, and my three year old sister going to the Calgary Stampede and having a wonderful ride on the ferris wheel with my little sister safely wedged between us. We must have taken the train, but I have no memory of how we got there! You’re tweaking my memory, Marian! We all wore those headscarves, firmly tied around our chins, didn’t we? I guess those headscarves, which we called bandannas, were carryovers from the old country. We always wore them outdoors in cool weather. Maybe more details about your trip to the Calgary Stampede will emerge as your subconscious mulls over it. Thanks for sharing your story, Elfrieda. Yes, you are right! No, my Mennonite family did not tour a brewery but we did vacation near Niagara Falls where these photos were taken. Watch for a link soon, Laurie! You got it, Susan! The second photo of the five family members was probably taken outside our cabin, just a guess. In those days, there were no motels, just little cottages (called cabins) with bedroom furniture and a tiny bathroom. Hmm, that’s a toughie. For some reason I felt like the sisters were on some sort of a raft like maybe Niagara Falls? One looks like you. so I’m going with the fifties? I cheated! I read all the other comments before giving my “two cents.” I wouldn’t have guessed a barrel at Niagara Falls (and I was just there this past April!) I would have guessed hot dog bun. Oh well, my imagination can run wild. But I did guess it was you and your sisters. Not that long ago ((’50s) and yet, it seems so very long ago. One value of “cheating” is benefiting from all the other comments. It’s a tribute to your imagination, I think, that the barrel became a hot dog bun in your head, Pam – ha! Yes, I agree, time becomes twisted when we see younger pictures of ourselves. As you say, not that long ago, but ages ago in my mind. It looks to me like the family is together for some outings and they’re a little bit dressy so chances are the parents encouraged the kids to wear their nice clothes 😉 Great pics. The link above tells the story of our family vacation: visiting Niagara Falls and sitting atop one of the barrels that successfully made it over the falls in one piece. We weren’t allowed to wear slacks or shorts, the usual attire for vacations, so that explains the dresses. Thanks, Christy, for adding to the story here! Thanks for guessing. It adds spice to the conversation here, Liesbet! Maybe it’s because I’m not American that I have no idea what the barrel photo means …I’m a little clueless but after reading some of the posts from our lovely group I’m learning … I’m feeling sea sick just thinking of it . Lovely family photos! Looks as if the girls are sitting on an inflatable boat? You are right about the girls, but we are sitting on the metal vessel that took Major Lloyd Hill safely over the mighty Niagara Falls in July 1949. Thanks for offering your educated “guess,” Fiona! I had no idea what girls were sitting on, but would have guessed farm equipment of some mysterious type. The car would help with the date if I knew car models. I read back through comments and was wrong about farm equipment. I see the three sisters in both photos so that’s the obvious relationship between the two. And family. A sense of strong feminine ties to family, a gift you’ve had all your life. I love your old photos. I have so many photos to sort through this winter. That’s the plan. After the dust has settled (bad pun!) you’ll have time to do some sorting and reminiscing. It should be fun and not such a chore when you get into it with Willow (?) by your side and a warm fire to stoke some memories. You are right! 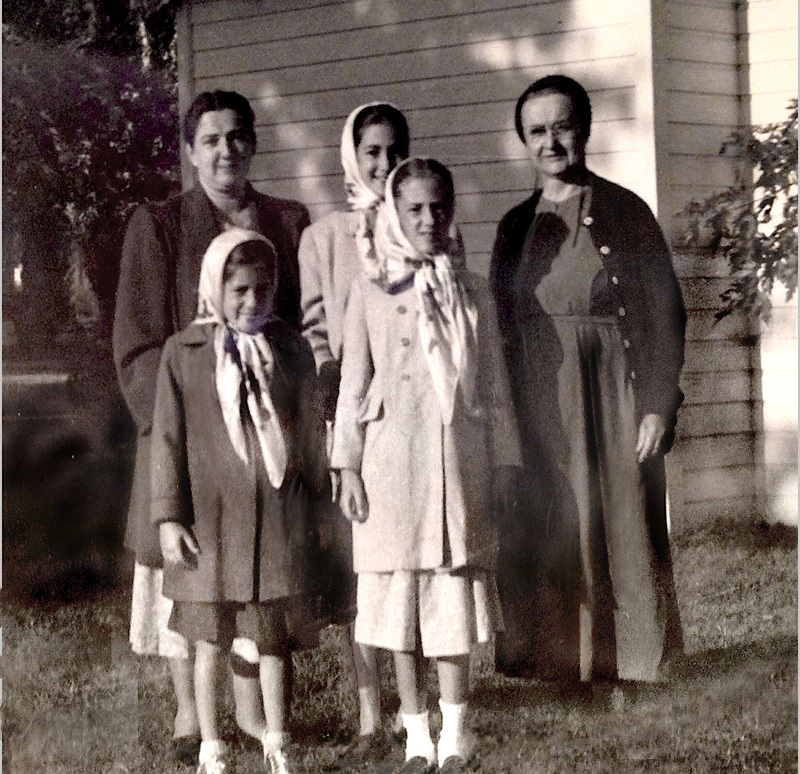 Mennonite culture was generally patriarchal in those days, but I experienced a strong sense of the feminine with my family. Thanks for your comment, tying it all together, Elaine.